It turns out the event that was downstairs from my pilates class was Jo Malone’s new fragrance launch. Model Iekeliene Stange was there dressed as a beautiful blue fairy. 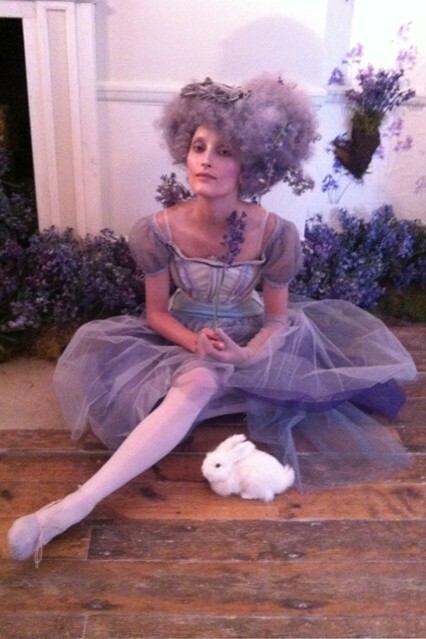 She’s the star of the dream like film directed by Vogue photographer Tim Walker shown at the event. The fragrance Wild Bluebell is a mix of cloves, lily of the valley and jasmine. It sounds like the kind of perfume I’d adore. I’ve always been a huge fan of bluebell woods, a feature of the countryside that’s so quintessentially English. When I was ten I went to a small wedding in the middle of a forest. My mum took photos of my brother and I dressed in wedding attire with the beautiful bluebell woods in the background. The distinctive scent of bluebell is bound to invite fond memories. I’ve recently become obsessed with Tokyo Milk’s Song in D Minor. The bottle is beautiful and the melody of white orchid, orange blossom, gardenia and amber notes is summery and deliciously feminine.